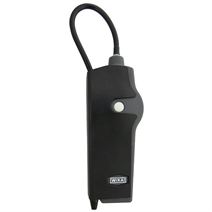 The model GPD-1000 gas detector is used for the detection of the smallest concentrations of SF6 gas and is thus ideally suited for the location of leaks. During operation, the approximate size of the leaks can be quantified via an audio signal. The instrument is notable for its ease of handling and good operability. Because of its low weight and its ergonomic form, this model is also the ideal partner for gas detection out in the field. Leak detection with this unit is through a flexible gooseneck, which in turn has a gas inlet on the front. An interchangeable measuring tip prevents unforeseen incidents and ensures the availability of the instrument at all times. The pump in the console case provides continuous flow of the sucked-in gas mixture through the measuring tip of the instrument.